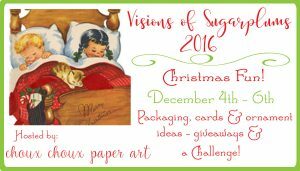 Welcome to day #2 of the annual holiday Visions of Sugarplums Blog Hop hosted by Lori Hairston! 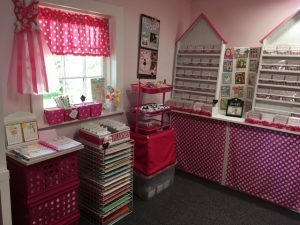 I’m thrilled that Lori invited me to share some projects again this year and hope my creations will help spark your creativity this holiday season! 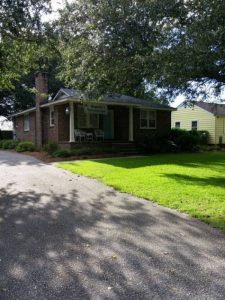 CLICK on the photos to see larger views! I created another couple of 4 1/4″ x 4 1/4″ cards for today’s project share! This design is simple and quick (perfect for our busy schedules this time of the year), and would make a sweet thank you or birthday card for the winter season! I added faux stitching to the kraft cardstock base using a chalk marker and then stamped the sentiment using the Let it Snow stamp set. I die cut the mitten from patterned paper using the Stitched Tags #2 Sweet Cuts set and then die cut the mitten cuff from white felt. The beautiful holly and berries was created by die cutting the leaves from green glitter paper using the Holly Days Sweet Cuts set and then adding some sparkly ‘berries’ using the Mistletoe Sequins mix! To finish this card off, I tied some Cupcake Seam Binding on the top of the tag! 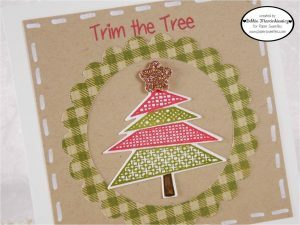 My second card today is another simple and quick design that can be easily mass produced – especially since you are stamping the tree twice to make this one card (once in red and once in green), so you’re doubling up and saving time! I added faux stitching to the kraft cardstock base using a chalk marker and then stamped the sentiment using the Merry and Bright stamp set. The scalloped circle was cut using a die from my stash and then I added the mixy-matchy adorable little tree inside the circle. 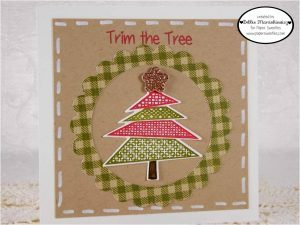 To create the multi-color tree, I stamped the tree image from the Trim the Tree set twice in two different colors, die cut using the Trim the Tree Sweet Cuts set, fussy cut along the horizontal lines and then paper pieced the tree back together, alternating the colors – easy peesy! The star was die cut from gold glitter paper using the Trim the Tree Sweet Cuts set! 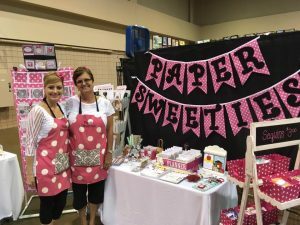 There are some amazing projects being shared over the next three days from some very talented crafters — be sure to stop by Lori’s blog FIRST and leave a comment to be eligible to win some of the FAB-U-LOUS prizes donated by the Visions of Sugarplums Blog Hop sponsors – including Paper Sweeties! 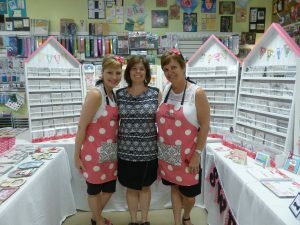 To be inspired by the beautiful projects that Lori and her guests are sharing with you, please BEGIN the hop from Lori’s blog! There is also a holiday challenge that goes along with this event, so if you have some time, go ahead and share a little goodie for another chance to win! 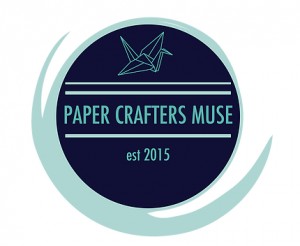 For another chance to win some goodness, share a project with us this month for the Paper Sweeties December ‘anything goes’ challenge – we have a yummy inspiration board to help jump start your creativity! 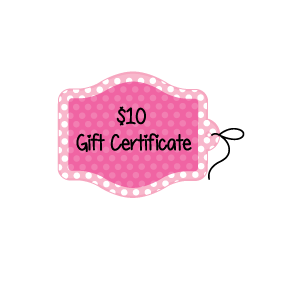 This month’s lucky winner will receive a $100 shopping spree – WOW! You can share your projects with us on the blog and/or in our Facebook Inspiration Group Album! 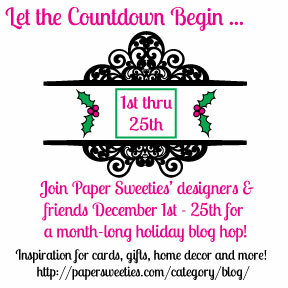 And, last but not least, be sure to continue to visit Paper Sweeties throughout the month of December — our entire design team along with some very special surprise guest designers (including Lori) are sharing projects all month long for the 25 Days of Christmas with Paper Sweeties to help you create the sweetest cards, gifts, party decorations and MORE this season! There are also ‘daily deals’ being offered, so mark your calendars and check back each day to cash in on the super savings! Today’s DAILY DEAL: 50% off ALL products used to make today’s featured cards: (links above) … NO COUPON NEEDED, discount will automatically be applied at check out! 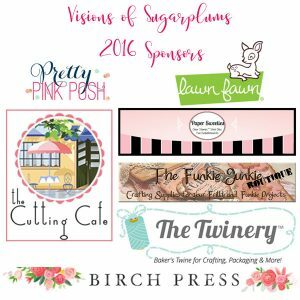 Visions of Sugarplums Blog Hop with Paper Sweeties! These cards are so cute Debbie!! 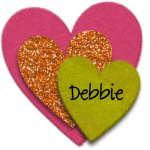 Debbie these little cards are so cute!!! I love the whimsical look to them! I saw your link on the card concept and wanted to stop by and say I love your pretty Christmas Tree card!! 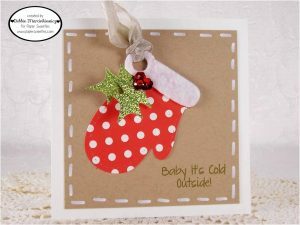 super sweet cards, luv the plaid and polka dots! I am so glad you played along with us at simon says stamp wednesday challenge! 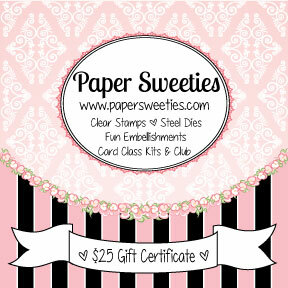 Adorable cards, love the kraft panels with the sweet embellishments! The faux stitching looks great! These are beautiful, Debbie! I love the little mitten! These are darling cards! I just made a 4×4 card and it’s just the perfect size! Beautiful Christmas cards, Debbie!!! 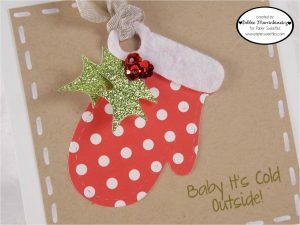 Love that polka dot mitten!!! Adorable! Love that mitten! Thanks so much for playing in our ‘CHRISTMAS’ challenge at Dies R Us! Please come back again soon! Both of your cards are so cute, Debbie! Love how the mitten and tree look with the kraft. Adorable! Great cards. I love kraft and your ideas are just so cute. Love that tree. Adorable cards!! Glad you joined us this week at FMS! Both of the cards would be perfect to mass produce. They are really cute!! Great colors and love the faux stitching. Adds a lot to the cards. Sweet cards. The small shape makes them extra cute. 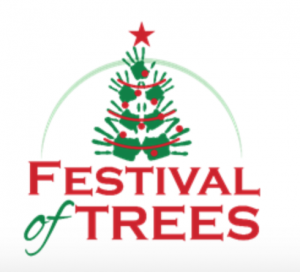 The mitten and tree die cuts are fun and whimsical. Thanks for sharing. Gorgeous cards! I love the traditional colours you’ve used! Thanks for joining us at FMS this week! Somehow I missed this one! These are adorable!! Love the patterns and colors along with the kraft… feels so homey. Beautiful! Love the cards. Plain and simple but so pretty. The tree is clever – two cards for the work of one. Very, very cute! 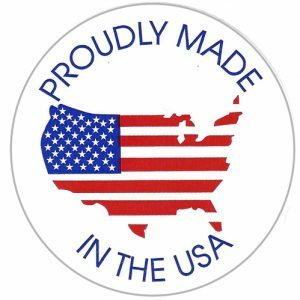 I really like the mitten! Awesome faux stitching on both cards! This is darling! So glad you were inspired by this week’s snow globe challenge at Cupcake Inspirations. Your cards are so cute. I just love the stamps and dies. I have these ones so I can’t wait to get started on some cards. Two sweet cards! Thanks for joining this week’s Cupcake Inspiration Challenge. Fantastic cards, love this simple design 🙂 Thank you for playing along with us in the DIES R US challenge! A duo of delight! I’m especially smitten with your polka-dot mittens! I need a pair like those in real life! 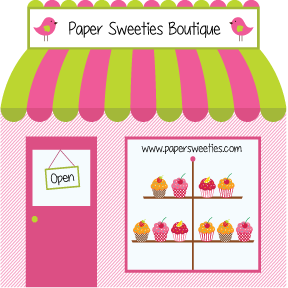 Thank you for sharing this gem in the Cupcake Inspirations *Snow Globe* gallery! Love the rustic feel to both of these cards. Thank you for joining in with the Link Up at 12 Months of Christmas. Adorable cards Debbie. You’ve done a great job of showcasing the fun paper. So glad you joined in the challenge at 12 Months of Christmas Link Up. Hope to see you in January.